New Year’s resolutions are goals that many of us are very familiar with and try to achieve. We all have high ambitions at the beginning of the year to complete these goals within a year. Sadly, the truth is that many people fail or fall behind with these goals as early as mid-January. The main reason why people give up or fall behind with general goals is not for the lack of wanting to achieve them, but time. Time is the one thing that most of us complain about not having enough of. Yet, those that reach their goals have the same amount of time as everyone else. Maybe the problem isn’t a lack of time but the way we use time? If you feel that you blink and days, weeks or even months have flown by without you making progress on your goal, you may need to look at how you spend your time daily. Becoming more productive and using your time more efficiently will mean a step in the right direction to achieving your goals. 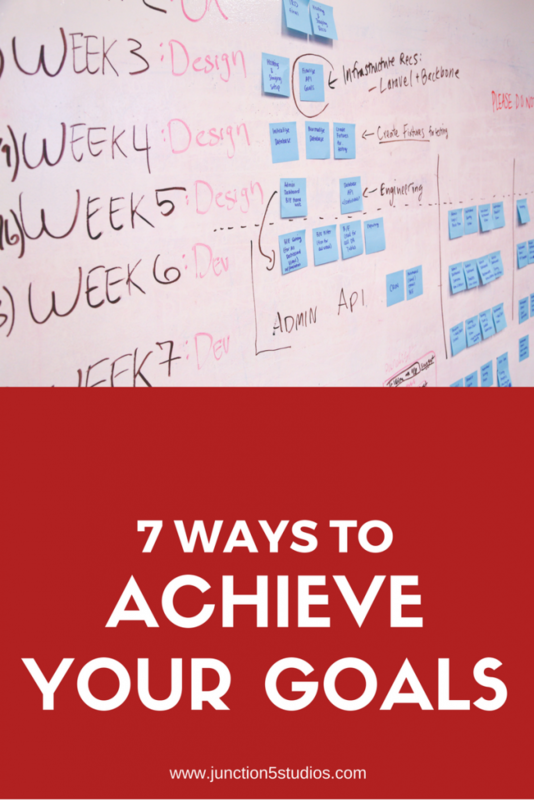 Here are seven ways to become more productive to achieve your goals. Yes, you may have a huge goal that you think are unobtainable. But, by breaking your goal down into smaller achievable targets you’ll find that your goal is easier to get your head around. If you’ve never stuck to a goal before, it’s probably best to start small. You may want to break yourself in slowly and follow the K.I.S.S. principle. Start first by splitting your goal into the biggest timescale. If you think you’ll achieve this goal in 5 years, then write down the five milestones you’ll need to achieve every year in order to reach this goal. With your yearly milestones defined, split the first year into 12 targets for each month. Next, focus on the first three months by breaking those month’s targets down into weeks. Finally you should be able to generate a daily tasks list. Do this by splitting the first four weeks targets into daily objectives. Having short term lists for daily and monthly tasks will keep you on track to achieving your long term goal no matter how far into the future they may seem. As you complete them, you’ll get a daily boost of confidence. And by working on them in bite size chunks, you will slowly see that your goal is a lot closer than you think. Whatever you use to organise your time, be it Outlook calendar, Google Calendar or a good old fashioned physical diary, grab your weekly schedule and find the holes of time no matter how small. Are you taking a bus or a train at any point in the day? Have a free 15 minutes after a meeting? List all of these down for everyday that you want to be productive with your spare time. Now that you know what jobs you will do within your free time slots and you know when you’ll be available, map out exactly which tasks you’re going to work on during these times. You can either match the tasks on your daily to do list that are appropriate to the amount of time you have available. Or, you can work of them in order of importance. Whichever way you choose to work through your daily lists, by importance or whether the task fits the time slot, make sure that you stick to one. Focusing and sticking to one way will make sure you get your jobs completed. As you will be completing tasks daily you need to keep on top of your to do list. Make sure it’s never empty. You don’t want to get to one of your free time slots and have nothing planned. In order to avoid this, try and revise your daily to do list the night before. It’s important to reflect weekly or even daily on the tasks that you’re carrying out. The tasks you set six months ago may have seemed relevant in order to complete your overall goal, but are they still relevant? Do the offer the same value? Has some other technique or tool been introduced that makes your task redundant or inefficient. Plan some time to reflect each week and research if your tasks are still the best way to drive you forward towards your goal. As you become more productive, you’ll want to save time in all areas of your work, especially those that are time consuming or just plain boring. If a task is time consuming, think about ways you can create systems to complete the task faster. Maybe you can outsource the work, or batch the entire process so you carry out five tasks once a month for three hours instead of five times a month for five hours. Automation is when you carry out a task using a tool that performs the work programmatically. For example, you want to be alerted before every meeting 15 minutes early so that you can grab your notebook and pen and read up on the meeting agenda. Instead of watching your calendar every hour and manually checking the time before the meeting, you can use the Reminder function in the calendar to automatically send you reminders alerts 15 minutes before each meeting. This will free you up to focus continuously on your task until 15 minutes before your meeting. Using tools, even small ones like this, helps to save us time to focus on more important tasks. Figure out what you can automate in your day to day tasks and you’ll become more productive. This will lead you to have more time to dedicate to achieving your goals. While carrying out your regular tasks, you should be writing down all the processes in documents. These will form the starting documents of your standard operating procedures (SOPs). APPs are great because firstly, they can highlight your process showing you where you may be wasting time. You can then devise a way to save time and maybe even automate it. Secondly, once you have this document, you have all you need in order to train another person to take over that task. This will free you up to focus on other things that maybe more time sensitive and can only be completed by you. Remember, don’t use all of your free time for work. It’s important that you schedule in “me” time as well. Ensuring that you are fully rested will mean more productive work sessions. Change up your resting time by reading a book to boost your productivity or simply one that satisfies your creative side. Trying to achieve your goals doesn’t have to be challenging. When we’re at the beginning of our journey and looking down that long road, we can’t seem to imagine that we’ll even get to the finish line. The act of breaking down your goal into smaller, easy to achieve targets helps you make progressive steps towards the end. But finding the time and sticking to this habit of moving forward in small steps is something that you also must discipline yourself to do in order to become more productive with your time. Once you change your daily routine to become more productive, you’ll find you’ll have more time to do the tasks to help you achieve your goal.